Being Grown up is Cool (not). 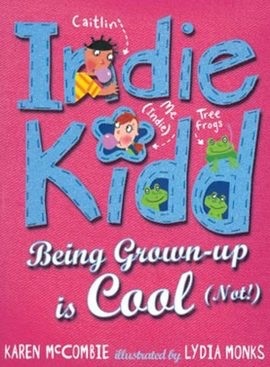 The main character is Indie Kidd. The other characters are Mum, Caitlin, Fee and Soph, Dad, Fiona and Dylan. Summary: There was a girl called Indie who was in her sister’s bedroom sniffing all her perfumes and body sprays. She had put one of her sister’s creams on. She went for her dinner whilst her mum sat doing work stuff. Her mum was an Assistant Manager at an Animal Rescue Centre. The cream she put on earlier wasn’t ordinary cream which she had rubbed over her left eyebrow and had removed half of it. Then her sister came in. She had gone to see a movie that afternoon. On Monday she was round at her friend’s house which there she said she wanted to be grown up. She started to write a list on being grown up is cool. Then her friend offered to go to the park and roll down the big hill but Indie said she should be going. When she got back to her house, Caitlin told her that her mum had an emergency at the rescue centre so she looked after Indie. After an hour or so, Indie said she would meet Dylan in the park to talk about her half an eyebrow problem. Then her dad called her because he was wondering where Dylan was so Dylan walked home and so did Indie. But instead of being in the park she was supposed to be with her neighbour Mrs O’Neill, As she turned onto her street, she saw Mrs O’Neill with her mum crying because she thought Indie got lost. But as she saw Indie Mrs O’Neill hugged her. Indie tried to escape the huge hug. As Indie got into the house she went up to Caitlin’s room which she found Caitlin was crying. She was in tears because she was in trouble. The next day when Indie was on her way home from school her friends Soph and Fee offered to go to a doughnut place but again Indie said no. Then it started to get windy and Indie didn’t want her fringe to blow up. On the way back to her dad’s she saw Caitlin with a baby. After she ate dinner at her dad’s she went home to find her mum cleaning out the frog’s cage. Then Indie went to Caitlin’s room where she found Caitlin crying about that she got sacked. Then Indie ran down stairs and asked her mum if Caitlin could help with her job. So they went to the rescue centre only to find that they were aloud to watch an operation. In this Caitlin fainted. When they were home, Caitlin wished she was ten again. It is about Indie really wanting to be a grown up. Only to find that being grown up isn’t cool. So she wishes she could stay that age. I would recommend this book to someone because it was good and fun to read. I would rate it 8/10. I think it was a good book but really easy to read. I think the age range to read it would be 8 or 9 years old. My not so favourite part was when Indie told Dylan about her half an eyebrow problem because I didn’t trust him. My favourite part was when Soph and Fee asked Indie would she like to go to the doughnut store because I love doughnuts!